Early white settlement in the Monroe area, which began in the 1860s, centered around three agriculture areas: the Woods Creek Valley to the northeast, the Tualco Valley to the south, and Park Place to the west. When the preliminary Great Northern Railway survey suggested that the new railroad would be routed through Park Place, a minor building boom began there in 1889 and a post office was established, but because postal regulations would no longer allow double names, the postal destination became Monroe in honor of the nation’s fifth president. However in 1891, the final routing of the Great Northern Mainline was located one mile east of Park Place sparking the development of what would become today’s Monroe, although Great Northern first named the station there Wales and the first plat filed around that station was called Tye City in honor of George Tye, the Great Northern Locating Engineer. 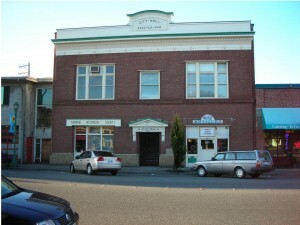 But in 1892, John Vanasdlen loaded his Park Place store with the Monroe Post Office onto runners and had it all hauled lock, stock and post office safe to what is now the southeast corner of Ferry and Main Streets. 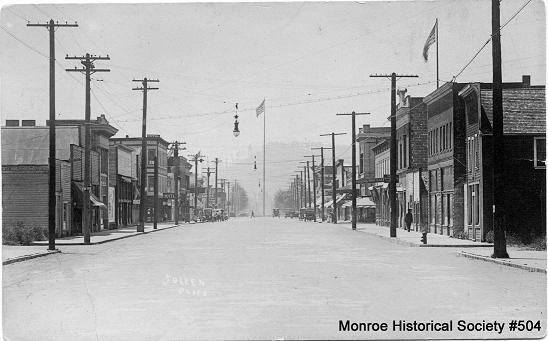 With the Monroe Post Office now in Tye City, the new town became officially known as Monroe. When the first train from the east came through Monroe on the just completed Great Northern Mainline in 1893, Monroe was a sea of stumps with just a few businesses scattered on both sides of the tracks. But the railroad had opened the markets of the east to the area’s rich forest products, particularly lumber and cedar shakes and the young town grew rapidly. 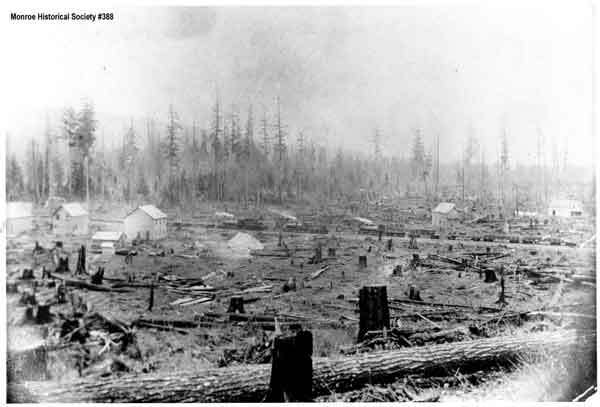 The first shingle mill was established in town in 1894 and the first sawmill up the Woods Creek Valley in 1897. In 1894, the first bridge was built across the Skykomish River giving the town a direct link to the rich farms of the Tualco Valley, and the first creamery was built in town the following year. The first church, the Methodist Episcopal Church, was built in 1896 on South Lewis Street. Monroe’s hometown newspaper, The Monroe Monitor, began operation in 1899 and continues as the oldest continuously run business in the community. 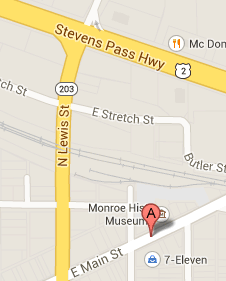 On September 16, 1901, the only complete block of businesses in Monroe burned to the ground. The fire was discovered at 1:10 a.m. by Dr. Ball, who was returning from a trip to Wallace (now Startup), when he saw that the entire upper floor of the Odd Fellows Hall was ablaze. The entire town responded to the alarm and managed to save much of the furniture and goods of some of the businesses and homes. With much effort, they were also able to keep the fire from spreading to the north side of Main Street. But all the buildings on the South side of the 100-block of East Main Street were destroyed as well as the buildings immediately across Ferry Street to include the Vanasdlen Store. 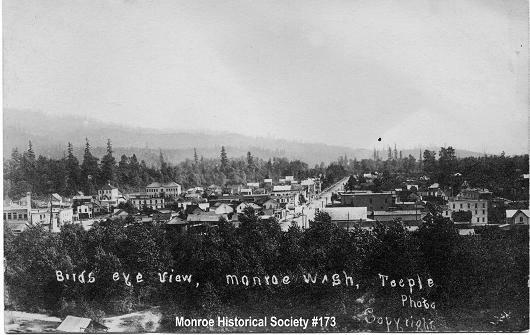 The 1901 fire did little to slow Monroe’s growth. The fact that most of the businesses were either underinsured or had no insurance did not stop them from rebuilding and rebuild most of them did. The fire also put additional urgency on creating a reliable community water system and on organizing a fire company, which had already been in the planning stage at the time of the fire. These concerns and others pushed the 325 citizens of Monroe to vote to incorporate the following year on December 20, 1902, one hundred years ago. Five years after incoporation, Monroe’s population has grown to over 1,000 residents. In 1908, community leaders built an impressive two-story City Hall building, attracted The Condensery, and attracted the new Washington State Reformatory. 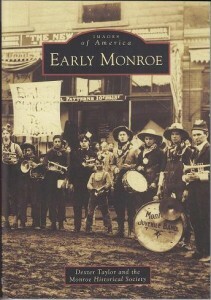 Ten years after incorporation, Monroe’s population had almost doubled and it was now the third largest community in Snohomish County after Everett and Snohomish.